It seems that everyone knows about GitHub -- the service that hosts many popular open source code projects. The underpinnings of GitHub are based on Git, which is itself an open-source implementation of a source management system. Git was originally built to help developers collaborate on Linux (yet another famous open source project) -- but now we all use it for all types of projects. There are other free and for-pay services that use Git, like Bitbucket and GitLab. And there are countless products that embed Git for its versioning and collaboration features. In 2014, SAS developers added built-in Git support for SAS Enterprise Guide. the Base SAS programming language, via a collection of SAS functions. You can use this Git integration with any service that supports Git (GitHub, GitLab, etc. ), or with your own private Git servers and even just local Git repositories. GITFN_CLONE Clones a Git repository (for example, from GitHub) into a directory on the SAS server. GITFN_DIFF Returns the number of diffs between two commits in the local repository and creates a diff record object for the local repository. GITFN_PUSH Pushes the committed files in the local repository to the remote repository. You could use the other GITFN functions to stage and commit the output from your SAS jobs, including log files, data sets, ODS results -- whatever you need to keep and version. SAS Data Integration Studio has supported source control integration for many years, but only for CVS and Subversion (still in wide use, but they aren't media darlings like GitHub). By popular request, the latest version of SAS Data Integration Studio adds support for a Git plug-in. 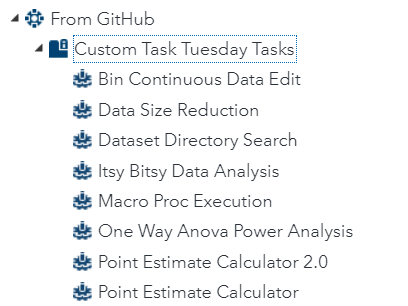 Read more about setup and use in the available here as part of our "Custom Tasks Tuesday" series. This isn't new, but I'll include it for completeness. 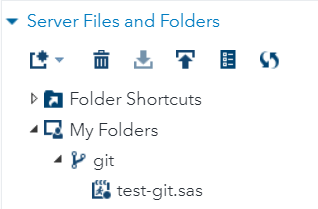 SAS Enterprise Guide supports built-in Git repository support for SAS programs that are stored in your project file. You can use this feature without having to set up any external Git servers or repositories. Also, SAS Enterprise Guide can recognize when you reference programs that are managed in an external Git repository. 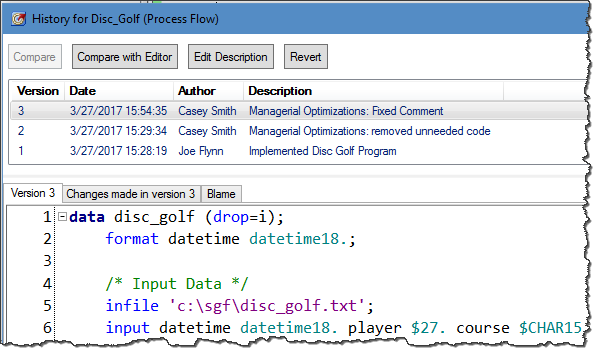 This integration enables features like program history, compare differences, commit, and more. Read more and see a demo of this in action here. 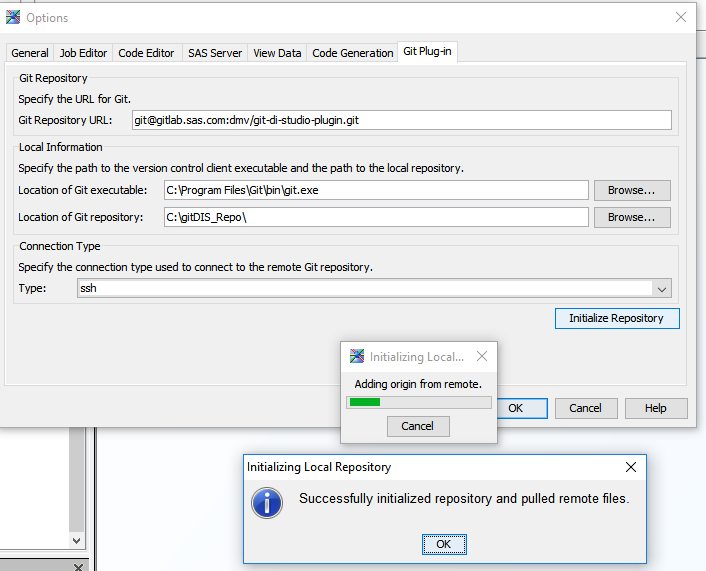 If you use SAS Enterprise Guide to edit and run SAS programs that are managed in an external Git repository, here's an important tip. Change your project file properties to "Use paths relative to the project for programs and importable files." You'll find this checkbox in File->Project Properties. With this enabled, you can store the project file (EGP) and any SAS programs together in Git, organized into subfolders if you want. As long as these are cloned into a similar structure on any system you use, the file paths will resolve automatically. The post Using built-in Git operations in SAS appeared first on The SAS Dummy. The goal of this article is to describe the steps needed to configure the bridge that allows SAS Data Integration 4.902, based on SAS 9.4M4, to load data directly into CAS on SAS Viya 3.2. Of course, SAS 9.4M5 simplifies this process, as a SAS/CONNECT communication will no longer be required, enabled by a direct function within SAS Data Integration to CAS - but for those of you who may not move immediately from SAS 9.4M4 to SAS 9.4M5, this could be helpful. 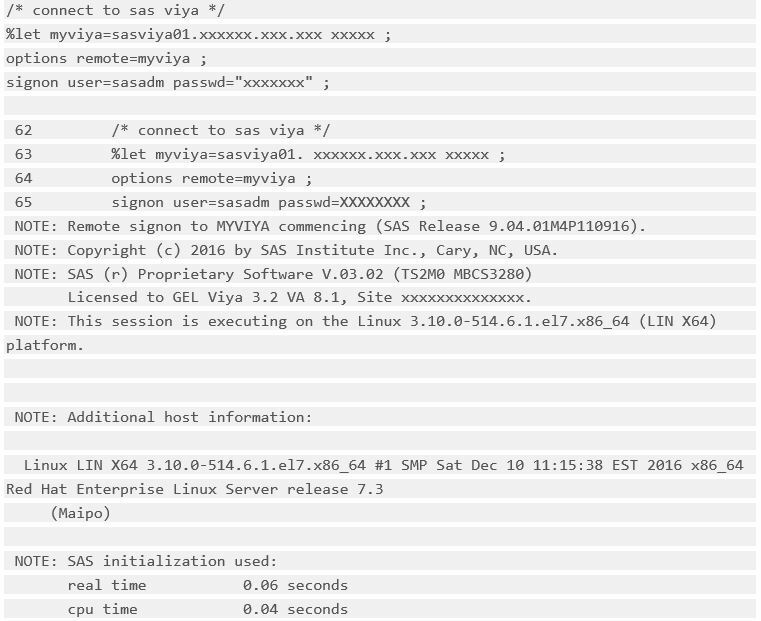 It is assumed here that SAS/CONNECT has been installed and configured on both environments, SAS 9.4M4 and SAS Viya 3.2. ⇒ Check the status of the SAS/CONNECT Spawner on SAS Viya, on the machine where this service is installed. ⇒ Note the machine and the listening port of the SAS/CONNECT Spawner on SAS Viya. 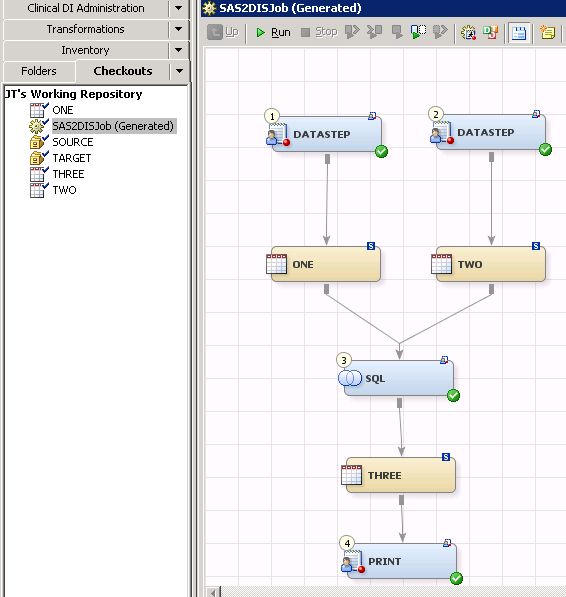 ⇒ Open SAS Studio on SAS 9.4M4 and sign-in. ⇒ Run the following SAS code with your machine details and a valid SAS Viya user account and check the results. ⇒ Open SAS Management Console 9.4M4 as sasadm@saspw. 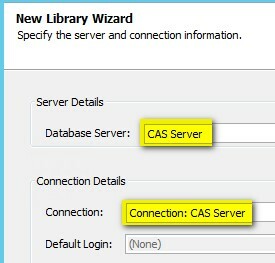 ⇒ Configure the CAS library as shown below and set the values accordingly (the CASLIB must exist in the SAS Viya environment; here CASPATH is the name of an existing CASLIB). ⇒ Open SAS Data Integration Studio 4.902 as a user who holds, directly or not, a login for the ViyaAuth authentication domain. 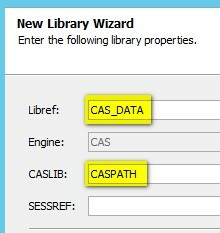 In SAS Environment Manager on SAS Viya, some tables must have been loaded before into the CASLIB (the one that is pointed on by the CAS library, here CASPATH), so that you can display some tables in the “Register Tables…” wizard. If you see some tables then it looks like you are all set. ⇒ If you want to go further and test the “Cloud Analytic Services Transfer” DI transformation, create the metadata for a target table in CAS with appropriate columns. 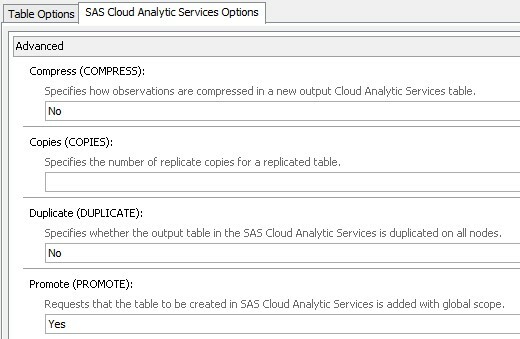 ⇒ The “Cloud Analytic Services Transfer” is basically a “Data Transfer” transformation that fits with CAS; it enables you to provide some CAS options such as COPIES; by default the table is PROMOTED. ⇒ Run it and check if it ran successfully and if the table is available from the SAS Viya world. ⇒ You might want to customize/clean some of the files here. Check the CASHOST option in autoexec files, sometimes the value is not appropriate. 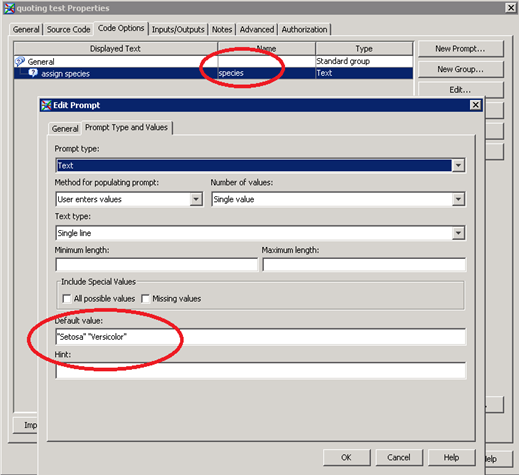 Normally, options here are sourced from the CONNECTSERVER_CONFIGURATION in vars.yml during the deployment of SAS Viya. SAS Viya 3.2 Bridge for SAS Data Integration Studio 4.902 (on SAS 9.4M4) configuration steps was published on SAS Users. 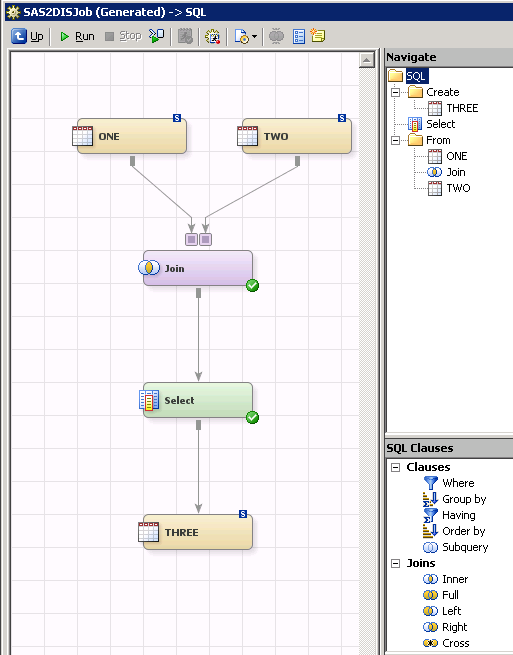 This is for for SAS programmers who might be reluctant to check out a GUI tool like SAS Data Integration Studio (DIS for short, which is graphic tool to implement ETL processes: extract, transform, load). DIS translates all users dragged nodes, transformations and process into SAS codes which are traditionally written by SAS programmers. I find one of the benefits of using DIS is that I can package all the ETL work to other players(technical or nontechnical) then they can replay the job by dragging and clicking. Just create a test folder in DIS (this demo was created in a working repository, in a Windows DIS 4.21 machine ) then right click mouse to “Import”-“Import SAS Code” to import the file created above then run the job generated and all set (you will get all stuff showed above). 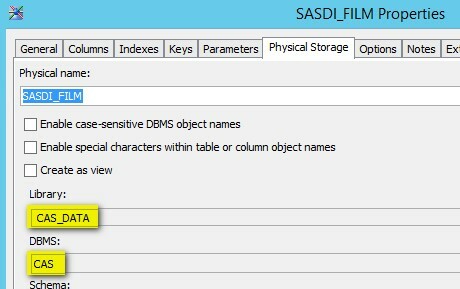 Note that the SAS libraries must be registered first in the SAS Metadata Server then you can use it. This demo omit this process only for demo purpose. Furthermore, without getting know bunch of the tool first, you can jump into DIS quickly by creating customized Transformations which are basically SAS codes with macro variables as the perimeters in the visual options box. Pretty neat? Just check it out! Last week I got another SAS certification, SAS Certified Data Integration Developer for SAS 9 and I must say it can’t be better as a SAS holiday gift for myself! It doesn’t hurt! Little better than nothing and holding a certificate will never make a thing worse off. It’s highly relevant. Only few additional efforts needed to take such SAS certificate examinations when worked as SAS programmer and solution consultant. It’s necessary(somehow). When worked as a SAS programmer at pharma, I played data manipulations techniques heavily, but never used a indexing method because it’s not needed due to limited cases of clinical data: recruiting a thousand subjects is even not a easy task! Then I took SAS Advance test and I filled the hole of SAS index. Most people who pursue an academic career do so because they are fascinated by their subject. It is for this reason that professors report among the highest rates of job satisfaction of all professions. Professors have found what they like to do, and they have found someone to pay them to do it. I’m always enamored of playing with SAS in any kind of forms: writing SAS codes, configuring SAS products, reading SAS books, taking SAS certificates, and very important, I’m paid to do these! NOTE: Line generated by the macro variable "SPECIES". ERROR: Syntax error while parsing WHERE clause. ERROR 76-322: Syntax error, statement will be ignored. Here is the point: since there quotation symbols were masked by %nrquote function, they are no longer valid syntax characters (then we got errors!). 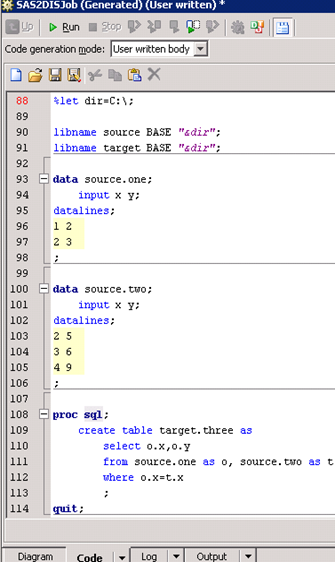 1)%nrquote function used while it is dated for a long time… %nrquote and %quote were replaced by %BQUOTE and %NRBQUOTE Functions. 2)All quotation symbols(“) were preceded by a percent sign (%). That’s %nrquote and %quote needed and why they are outdated any more.